Private Peaceful is a sickly sweet, but rather bleak rites of passage tale set in wartime Britain and ultimately, it makes for a bland and unexciting adaptation of Michael Morpurgo’s successful novel. 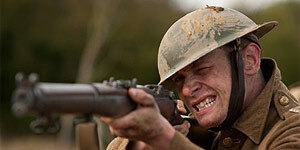 Directed by Pat O’Connor, Private Peaceful is based on the novel of the same name by Michael Morpurgo (he of War Horse success) and stars Jack O’Connell and George MacKay as Charlie and Tommo Peaceful, two brothers living in wartime Britain with their widowed mother, Hazel (Maxine Peake) and older brother Joe. Since they were young, Charlie and Tommo have both been madly in love with Molly Monks (Alexandra Roach), an attractive local brunette, who much to Tommo’s heartbreak weds Charlie after falling pregnant. When the Great War commences, both Charlie and Tommo are conscripted into the army to fight in the French battlefields, where they must contend with matters of war, love and honour. Overall, the entire cast generally make an impressive effort with the standout performance actually going to George MacKay as Tommo, who pulls off a great vacant but jealous stare and demonstrates his ability to work with a wide array of scenes and emotions. Alexandra Roach as the worshipped Molly also impresses, and despite Maxine Peake looking a little too young for her role as a tired mother of three twentysomething boys, she gives a convincing performance. The original book of Private Peaceful follows 24 hours of life on the frontline as its leading protagonist looks back on memories from his home and childhood, but this film adaptation prefers to account the tale chronologically, and as a result it generally just goes through the motions and quickly develops a slow but consistent pace. It’s not that Private Peaceful is completely terrible; it’s just that it’s all rather bland (a likely consequence of it being so safe with its script and love scenes) and it lacks the visual spectacle that we saw in War Horse. Morpurgo’s book was aimed at older children and, one assumes, so is this filmic adaptation; but, it’s hard to tell which children will take joy from Pat O’Connor’s flat direction and fear of experimenting with boundaries and sequences, which makes this film probably more suited to older viewers with traditional tastes. A sweet but safe adaptation of Michael Morpurgo’s novel, Private Peaceful is ultimately forgettable thanks to its lack of visual excitement and slow pace, but those with traditional tastes will probably be satisfied.